Lorraine Gordon, Keeper of a Shrine to Jazz Lorraine Gordon is the keeper of New York's historic Village Vanguard. Recently, Gordon published a set of memoirs, the recollections of a woman who was married to two famous men of jazz. Lorraine Gordon is the keeper of a shrine to jazz — New York's historic Village Vanguard. Recently, Gordon published a set of memoirs, the recollections of a woman who was married to two famous men of jazz. The book recalls a life lived beyond society's expectations — a colorful swirl of music, politics and family. Now, at age 84, Gordon is the driving force behind a still-vital Vanguard, and the formidable guardian of its fabled legacy. The Vanguard is the most revered venue in jazz. John Coltrane, Miles Davis and Thelonious Monk are among the many legends who have played the small, wedge-shaped room. "The room really responds to some artists more than others," Gordon says. "The walls start to shake a little when there's no business and the room says forget it, the vibes aren't right. I listen to the room. The room tells me a lot." Gordon's personal history with jazz goes back to 1930's Newark, N.J., when she was Lorraine Stein. "That's the oddest part," she said, "because I grew up in a very middle-class family who never played a record. I don't remember any music in my house except for the records I played." Some of those discs were on the emerging Blue Note label, a small outfit run by German emigre Alfred Lion. Lorraine eventually met Lion and the two were married in 1942, with Gordon soon making her own contributions to Blue Note's early successes. She'd listen to session playbacks, deciding which of the tunes would make it to vinyl, and the resulting albums helped establish Blue Note as a premiere label for the best in jazz. The Lions occupied a small flat in Greenwich Village, the hub of bohemian life in New York. Back then, Gordon says, the Vanguard was a haven for poets. They read their works aloud and audiences tossed money onstage in appreciation. 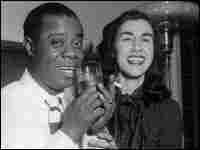 When Sunday afternoon jazz was added to the Vanguard's entertainments, Lorraine and Alfred became regulars. Still, it was after her time with Lion that the Vanguard became a permanent part of Lorraine's life. After eight years, she and Alfred met with both marital and business problems. There was a painful transition. 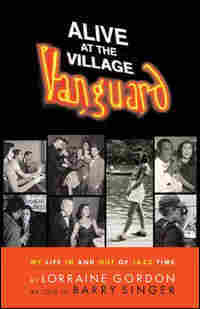 Then, in 1950, Lorraine married Max Gordon, owner of the Village Vanguard. They had two daughters, and Lorraine became a mother with a taste for politics. She joined Women Strike for Peace, a group of anti-nuclear moms, and she opposed the Vietnam War, traveling to Moscow and to North Vietnam. Jazz returned to center stage in Lorraine's life in 1989, when Max Gordon died. At age 70 Lorraine found herself the owner of the Vanguard, by then a jazz institution. "The night he died, I closed the club," she remembers. "Max never asked me to run the club, he asked nobody to run it ... I closed it for one night, and the next night I opened it." Gordon's memoir is called Alive at the Village Vanguard. Barry Singer, its co-author said of Gordon, "If you look at her life, the arch of it, it's almost like destiny that this is what she would wind up doing, because she was perfect at it." Relying on her instincts and her love for jazz, Gordon taught herself the nightclub business, saying, "I have good ears. That's my gift — that I know when something is good, and I want it to play here." So Gordon books artists that appeal to her personal tastes — including saxophonist Joe Lovano, who says Gordon takes a decisive role in running the club. "I've seen her throw people out, and not care if people come in or not. She's got a strong energy, and when she's there, her presence is felt by everyone." The people who know Gordon describe her as plainspoken, opinionated, and "one of a kind." "Even the musicians say she kind of scares them with her intensity and her frank way of speaking," says Barry Singer. "I've always suspected there was a warm person underneath. The more I've gotten to know her the more I understand how sensitive she is." The Village Vanguard is booked nearly to the end of the year. So, Lorraine Gordon will stay at her desk, backstage, paying bills, answering the phone, and doing whatever it takes to keep the place going. Still, when the lights go down, she's once again that teenage fan from Newark, lost in jazz, her first love. It was Ike Quebec who first took us to see Thelonious Monk. Ike didn't say about Monk: "Record him." He just said, "Come on, I want you to hear someone." Ike didn't take us to a club either, he took us to Monk's West 65th Street apartment. And Alfred and I... well, we heard him. Monk's room was right off the kitchen. It was a room out of Vincent Van Gogh somehow - you know, ascetic - a bed, a cot, really, against the wall, a window and an upright piano. That was it. We all sat down on Monk's narrow bed — our legs straight out in front of us, like children. I looked up for a moment and saw a picture of Billie Holiday taped to the ceiling. The door closed. And Monk, his back to us, began to play. He had enormous hands. Those hands almost stammered, it seemed to me, right above the keys. 'Where are they going to come down?' I kept wondering. It was just riveting to watch. There were a lot of modern musicians I didn't understand — they were fast and terrific but not comprehensible to me, necessarily. Thelonious Monk I understood. Always. Monk was a revelation. From our very first encounter he was right in my groove. He was always working on something new. That day we heard him composing what would turn out to be "Ruby, My Dear," one of Monk's most admired signature compositions. He didn't even have a title for it yet. I just loved the melody, so much so that I can remember thinking: 'Boy, I wish he'd name it after me - call it "Sweet Lorraine" or something.' Eventually, in the course of a later visit, Thelonious did tell me that he had titled this piece "Ruby, My Dear," and I said to him, "Oh, who's Ruby?" "No-one," Thelonious answered. "I just like the name." Did Monk's records sell at first? No, they didn't sell. I went to Harlem and those record stores didn't want Monk or me. I'll never forget one particular owner, I can still see him and his store on Seventh Avenue and 125th Street. "He can't play lady, what are you doing up here? The guy has two left hands." "You just wait," I'd say. "This man's a genius, you don't know anything." Thelonious Monk became my personal mission. I was really fighting everyone. I mean, I went huffing and puffing around with those records and my mind was undivided. When I have something to do and want to do it, nothing fazes me. And Monk didn't faze me. I just knew the man was great. We began to hang out with Thelonious — Alfred, Frank and I — at Monk's family home. We met his mother, his sister, his brother-in-law. Thelonious was not married yet when we first met him. We sort of became part of the Monk family. Thelonious was so eccentric and non-verbal, I really became his mouthpiece to the public. At one point, out of sheer enthusiasm, I wrote a letter to a newspaper I admired very much at the time called PM. PM was very hip and I enjoyed reading it. I addressed this letter to the editor, Ralph Ingersoll, and described Monk to him as "a genius living here in the heart of New York, whom nobody knows." Well, Ingersol caught my pitch. He called me and said that he was going to send Seymour Peck, one of this best writers, to do a feature on Monk. I said fine. I remember picking up Seymour Peck somewhere in my car and driving him that day to Monk's apartment. When I started to get out of the car with him, though, Peck balked. "Where do you think you're going?" he said. "I do this alone." "I don't think so," I said. "Thelonious is not that talkative. Without me I don't think this will work." "Don't worry about it," said Peck." And he went on in alone. I sat outside in my car waiting. Within five minutes, here comes Peck storming out. "There is no story there!" he shouted. "The man doesn't speak!" "I tried to tell you," I said. Back at work I called Ralph Ingersoll. "Look," I said. "There certainly is a story in Thelonious Monk. A big story. But either I have to be there with him or you have to send another reporter." "Fine," Ingersoll said. And back comes Peck. This time we go in together. The result: a huge, 2-page centerfold story on Monk in PM. What happened? With me there, Monk talked. I mean Monk talked to other musicians, to Alfred, to me. He just didn't talk to strangers. PM took pictures of the apartment, of Monk's room right off the kitchen, and a picture too of the refrigerator in the kitchen, for some reason. This fridge picture actually showed up in the article, with a caption that described the fridge as dominating the apartment. Well, Thelonious' mother got very angry with me. She said that I had embarrassed them and why did PM have to talk about the apartment? I said to her, "Look, Mrs. Monk. Your son is going to be very famous. This is just the beginning. You will have to get used to this." We originally reported that Lorraine Gordon was 70 years old when her husband died in 1989. In fact, she was 67.